Peoples Voice Conscious Citizens' "Statement on Kashmir"
We write this in anguish at another alarming spiral of violence in Kashmir, when a discredited old playbook has yet again been deployed to wreak havoc with civilian life. Kashmir’s escalating violence follows a familiar pattern: a killing, a funeral where rage is vented through slogans and stones, and volleys of lethal gunfire in response. In 2010, this cycle rolled on repeatedly through four months, claiming over 110 lives, mostly of Kashmiri youth, including a number who were too young to know. Nothing has been learnt from that year of catastrophe. The trigger for the current surge of unrest in Kashmir was the killing on July 8 of Burhan Wani, a militant of the Hizbul Mujahedin. The circumstances of Wani’s killing are yet to be fully explained. It is nonetheless ironic that it occurred on the very day the Indian Supreme Court issued a far-reaching judgment in the context of fake encounters in the state of Manipur, emphasising the illegality of the use of excessive and retaliatory force by the army, security forces and police. 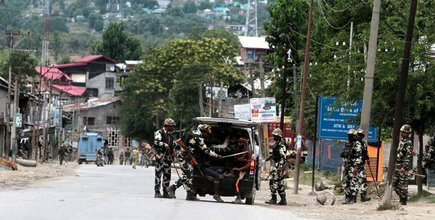 These strictures apply even in disturbed areas under AFSPA. Kashmir is an arena where the Supreme Court’s observations that the rule of law would apply “even when dealing with the enemy”, and that indeed, whatever the challenges, “the country’s commitment to the rule of law remains steadfast”, are breached on a daily basis. Available accounts of Burhan Wani’s life in militancy indicate that he was as a 16-year old, embittered and radicalised during the 2010 turmoil by the casual humiliations heaped on ordinary Kashmiris by the mass deployments of security personnel. He witnessed repeated violent incursions into his home and the harassment of near relations in what are called “crackdowns”, in terminology that has entered the youth argot of the valley. The death of his brother in a police encounter, when he had nothing to do with the militancy, is believed to have further hardened his resolve. Burhan Wani’s life story should be cautionary warning that the heavy-handed, militaristic Indian approach to Kashmir, has only led to a quarter century of siege and growing alienation. Wani’s funeral on July 9 in the southern Kashmir town of Tral witnessed a gathering of several tens of thousands. As protests broke out in this and other locations, security forces responded with maximum force. The death toll of thirty in a matter of three days, tells its own grim story. Excessive and indiscriminate lethal force continues to be used for purposes of law enforcement. This is in brazen contempt of the U.N. Basic Principles on the Use of Force and Firearms by Law Enforcement Officials, which do not allow for departure even in exceptional circumstances such as internal political instability or public emergency. Pellet guns, introduced in 2010 for crowd control, purportedly on the ground that it injures and does not kill, have caused permanent injuries and irreversible loss of eyesight to at least 92 young men. The upsurge of civil unrest comes after a long sequence of intelligence reports that flagged rising discontent at the new political arrangements in Jammu and Kashmir. The BJP’s arrival in the portals of power and its determined pursuit of a majoritarian agenda, have much to do with this. Curiously, the intelligence warnings have focused on widening access to the internet and social media as a disruptive influence. This diagnosis which focuses on the symptoms rather than underlying realities, has fed directly into the shutdown of internet services in Kashmir, the thirteenth such closure in three years. Certain recent observations of the Supreme Court, though made in reference to Manipur, bear repetition as general principles. Mass deployment of the army and security forces in aid of civil authorities always is predicated on the premise that “normalcy would be restored within a reasonable period”. If normalcy is not restored for a “prolonged or indeterminate period”, it would be firm evidence of the “failure” of the civil administration or of the armed forces, or both. Whatever the case, an unending state of unrest could not “be a fig leaf for prolonged, permanent or indefinite deployment of the armed forces as it would mock at our democratic process”. The time is long past, if ever there was one, when a solution to the Kashmir problem could be achieved through force. Continuing recourse to this option and the prolonged and bloody stalemate that has ensued, have fuelled a mood of anger and despair in Kashmir. But with firmer iterations of the military option from the highest political leadership, a dark mood has taken hold in the rest of the country, a doubling down on the current strategy and a tendency to brush off every manifestation of failure with hateful and intemperate rhetoric directed at the people of Kashmir. We recall the statesmanship shown by Prime Minister Atal Behari Vajpayee in 2003, when he went to Srinagar during a particularly dark time, held out a “hand of friendship” to Pakistan and said that the dialogue on Kashmir would be held within the paradigm of humanity (insaaniyat ke daayre mein). It is particularly unfortunate that no Union Minister has visited Kashmir in this crisis and that the state leadership and elected legislators are reportedly too insecure to venture out among the people. We call for urgent steps from the Central and State government to prevent civilians being killed and injured, and immediate steps towards demilitarisation of the Valley and an inclusive political initiative. This has to go along with an urgent review of AFSPA, leading to its repeal alongside the entire constellation of special security laws that reward atrocities on civilians and encourage impunity. We urge all political parties to pressure the Government to open a political dialogue in good faith with all relevant parties to ensure that the bleeding wounds of Kashmir are staunched. KETAKI CHOWKHANI, PHD STUDENT, TISS, MUMBAI. MANISHA SETHI, JAMIA MILLIA ISLAMIA, NEW DELHI.